In November of 2000 I had surgery to repair damage from dislocating my right shoulder. 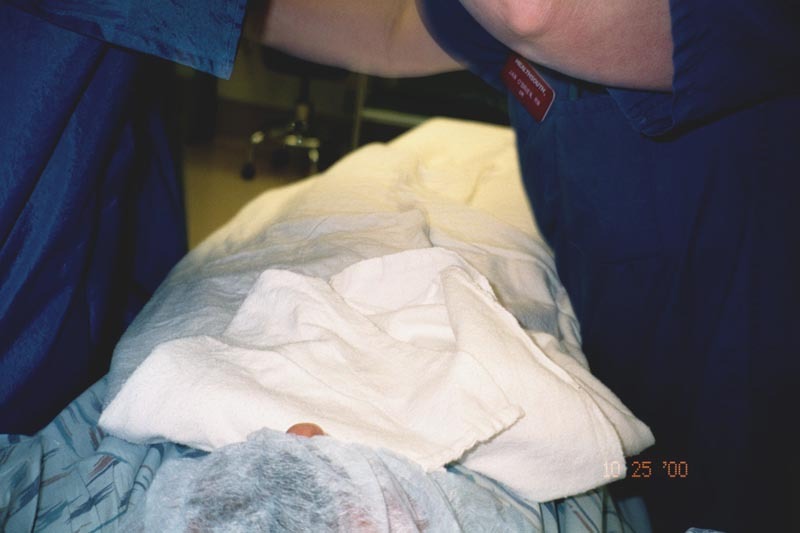 I have now had the same surgery on both shoulders. The story of both are told below in parallel. This page, part 1, describes all the prep and does not contain any photos of the operation itself. 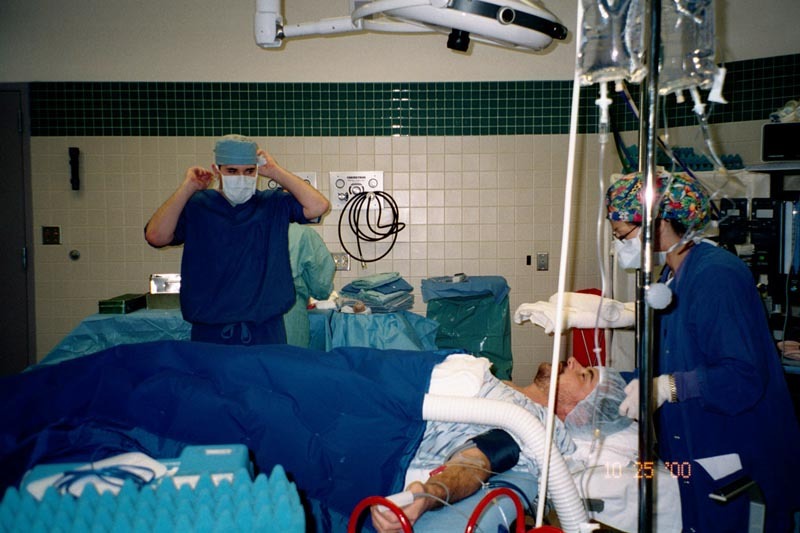 The next page, part 2, contains photos of the operation. 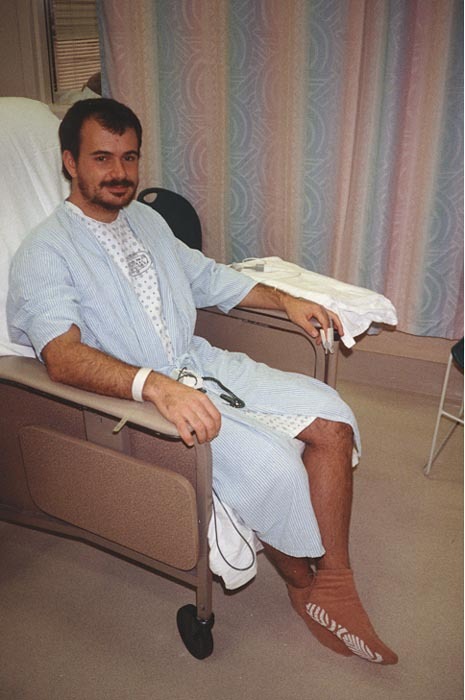 I first dislocated my left shoulder around 1983, while wrestling (for fun). It hurt, but went back into joint right away. I knew what had happened, but didn't think too much about it because my father had had the same problem. A couple years later I dislocated my shoulder again, then a couple years after that. 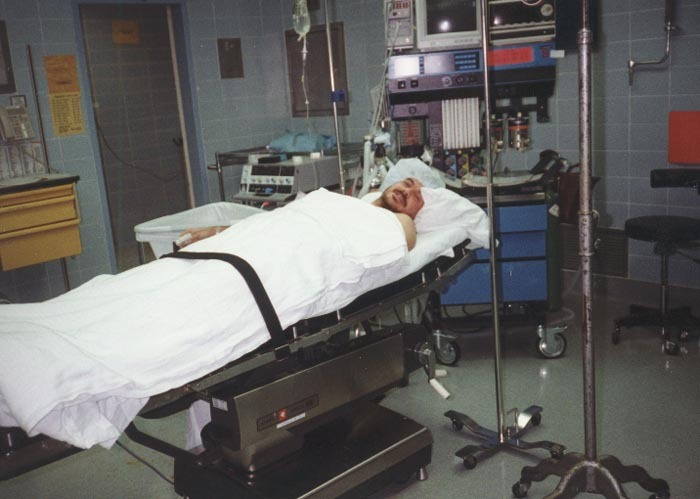 Over the years the dislocations occurred more frequently and with less trauma. By 1993 it was happening about every 6 months. The last time occurred while I was stretching in bed in the morning. At that point I already had an appointment with a surgeon, Dr. Kirby. 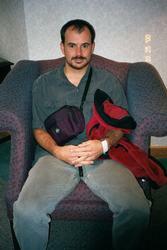 My first right shoulder dislocation occurred in 1992 while hiking in New Zealand. Emily and I were doing a remote, rugged backpacking trip near Arthur's Pass. I lost my footing moving across loose rocks and fell forward. I put my arms out to catch myself and the heavy weight of the pack on my back over stressed and dislocated my right shoulder for the first time. For the first time I needed some help relocating my shoulder. Emily pulled while I relaxed and it went back into joint. I had to finish the difficult trip with my arm in a makeshift sling. On one desperate evening we were bushwhacking through dense brush as the sun set and a light rain set in. I grabbed a tree with my left hand, pulled too hard, and dislocated my left shoulder. I did some physical therapy for this shoulder and hoped that I had not destabilized it too much. 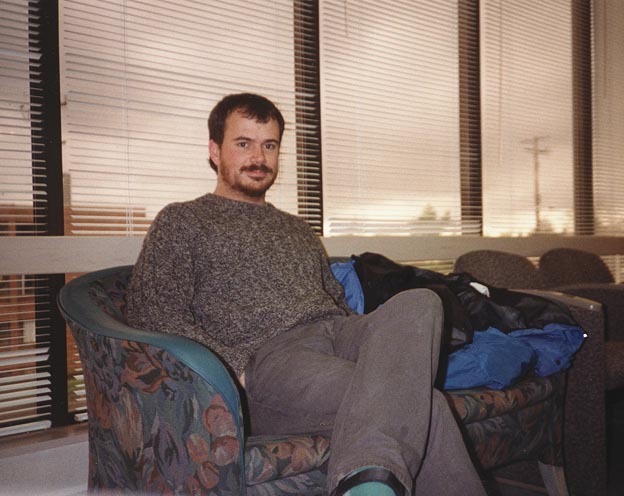 Then, in July of 2000 I was in the San Juans kayaking. One evening I went out to practice Eskimo rolls. I camp up from one, started to go over to the right, did a high brace, let it my right arm get too far back, and my right shoulder slid out of joint. I rolled over and found myself upside down in my kayak with a dislocated shoulder. I popped my spray skirt, swam to Andrew. He pulled while I relaxed and my arm went back into joint. Based on my experience with my left shoulder I knew that it was just a matter of time before I would dislocate my right shoulder again so I called my surgeon, Dr. Kirby. 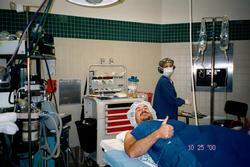 His assistant, Shelly, said that with only two dislocations I didn't really qualify for surgery. I explained how each happened, that I'm an active person, and that the next dislocation could happen in an even more dangerous situation. That convinced her and I was allowed to schedule. But it took me a couple months to commit. 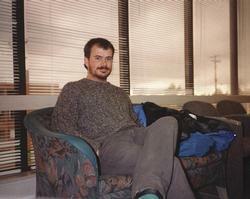 From previous experience I knew the recovery would be long and painful recovery. But I also knew that the results were well worth it. I scheduled for October 25th, 2000. 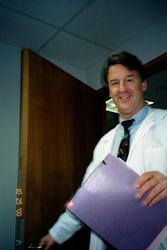 Dr. Kirby had been recommended to my by a couple people who said he was excellent. 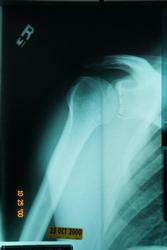 At my first visit he took some X-Rays which showed that I had the typical signs of anterior shoulder dislocation. Dr.. Kirby said they had three criteria for operating: 1) 3 or more dislocations, 2) dislocation affects life style, and 3) ... I forgot the third. Anyway, I qualified and all I had to do was schedule the surgery. This time I didn't see Dr. Kirby until the morning of my surgery. I came to his office for a pre-surgery examination. They took X-Rays of my right shoulder, which showed the typical signs of anterior dislocation. Kirby and Shelly answered the few questions I had, gave me a prescription for my pain medicine, and sent my on my way till the afternoon surgery. 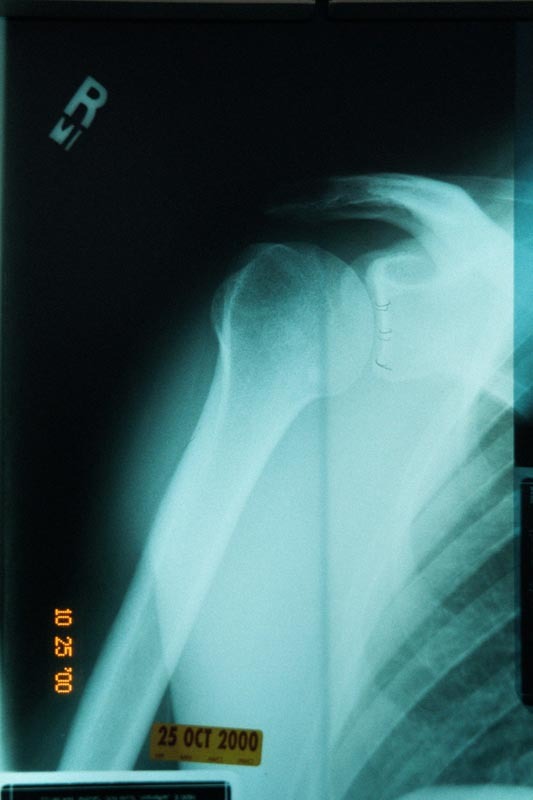 This is my left shoulder. The dark circle on the top of the humorous head is a dent created when it slides forward and hits the front of the glenoid. (My left shoulder showed that plus a bone spur that had been torn loose.) The three lines on the anterior edge of the glenoid were drawn in by Dr. Kirby to show me where the stitches would be placed. Anterior dislocation tears the capsular ligament from the anterior edge of the glenoid fossa. The actual tear happens at a slightly deeper layer than is shown in the diagram above. 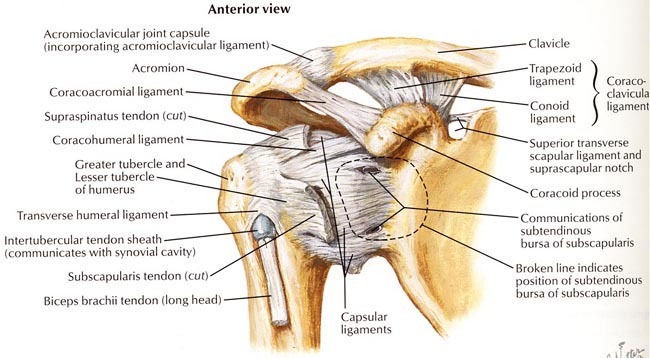 To get to the joint capsule the tendon of the subscapularis muscle must be cut. No one told me about that in my first surgery. 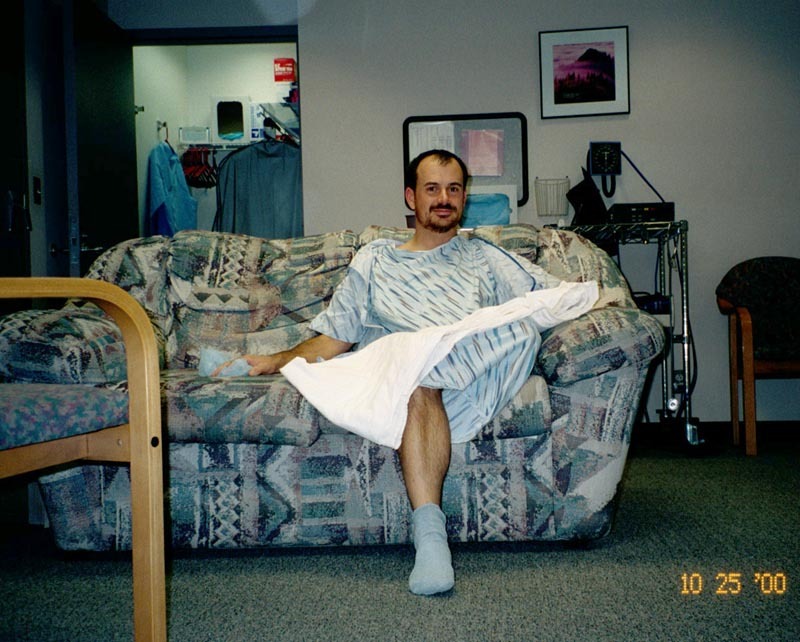 In '93 I lived on Capitol Hill and was able to walk from home to Providence hospital for my surgery. Now I live in Ballard. After my morning appointment I did some errands, went home,and Marie drove me to the "Seattle Surgery Center" on first hill. I was late getting home then I5 was backed up. As a result I got to the surgery center a half hour late. Once there I realized that I also forgot my photo ID and insurance information. But it all worked out. First, I wait in the lobby, about 20 minutes This time the lobby wait was much shorter. The place is pretty empty. From the lobby they take me back to surgery waiting. Here I have to change into the hospital uniform and they check my vitals. 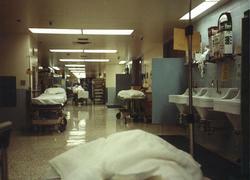 There are several other patients in the room and hospital staff moving through constantly. 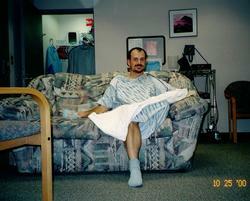 First I go through an intake, a nurse takes my vitals, then I change into the hospital uniform and wait on the couch. I was the only patient at the surgery center that afternoon. My anesthesiologist, a woman named Kim, comes out to talk to me in the waiting room. She describes what is going to happen. When she gets to the part where I "fall asleep" I back her up and ask what happened to the local only option. Somehow she got the impression I wanted general. I don't, which is fine with her. Not only is local only easier on my body and safer: I also get to "watch" the surgery. 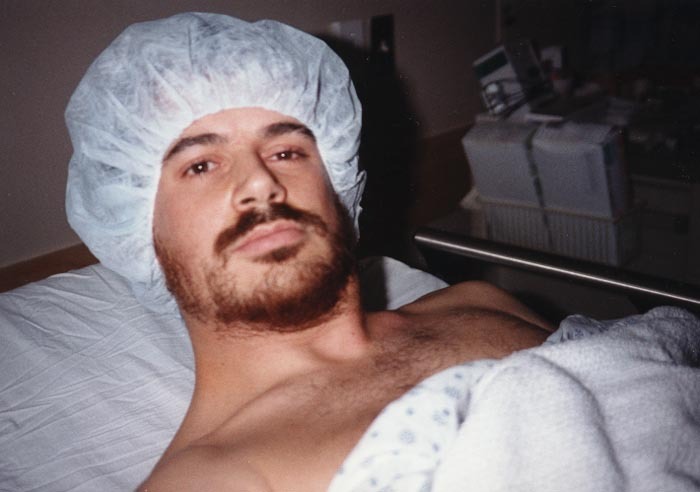 A nurse takes me down to the "prep". Riding down in the elevator another nurse notices the camera I carry and correctly guesses that I'm here for orthopedic surgery. 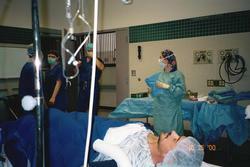 It is common for orthopedic patients to photograph their operations. 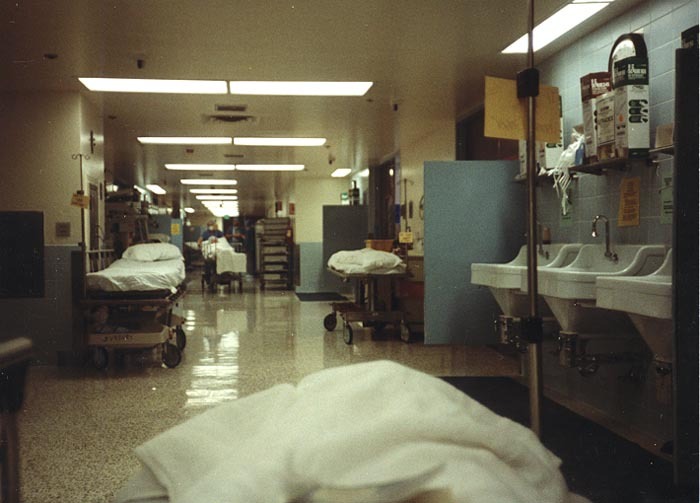 I'm put on to a gurney and rolled down the long hospital corridors. This time there is no prep room. 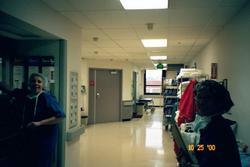 With the details agreed on, Kim and I walk down the hall directly to the operating room. I lay down on the table and am covered by warm blankets. It's pretty cozy. There is a lot of activity around me. 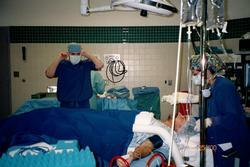 The anesthesiologist applies a local nerve block. He has a large needle which he puts in my neck. Soon my left arm starts twitching. He injects some drugs, then moves to another spot in my arms. Again, my arm starts twitching. I realize that it is not a co.-incidence. There is an electrical probe on the end of the needle which triggers the nerve. When the right part of my body starts twitching he knows he is on the right nerve, and injects the anesthesia. It took Kim a little while to find the right spot. At first my right rib cage was twitching, then Kim asked for the voltage to be turned up, then she found the right spot and my right arm was really jumping. 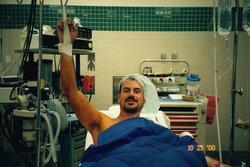 This time the nerve block consisted of only one injection. 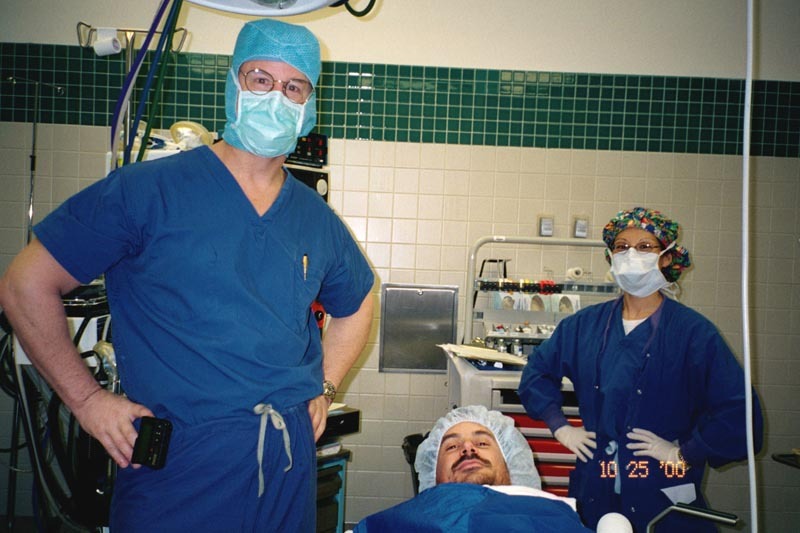 She said that it covered most of the area of surgery and that local anesthesia was used at the boarders. 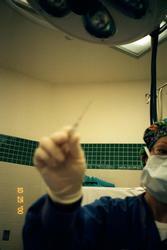 I asked KIM to show me the needle AFTER she applied the nerve block. When she does I snap a picture with my left hand. I wait some more for the nerve block to take effect. 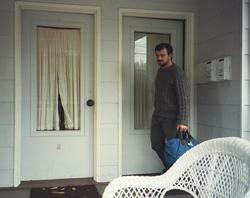 Now I pass my camera off to one of the many assistants and I'm ready to go. The surgical team continues with prep while the nerve block takes effect. 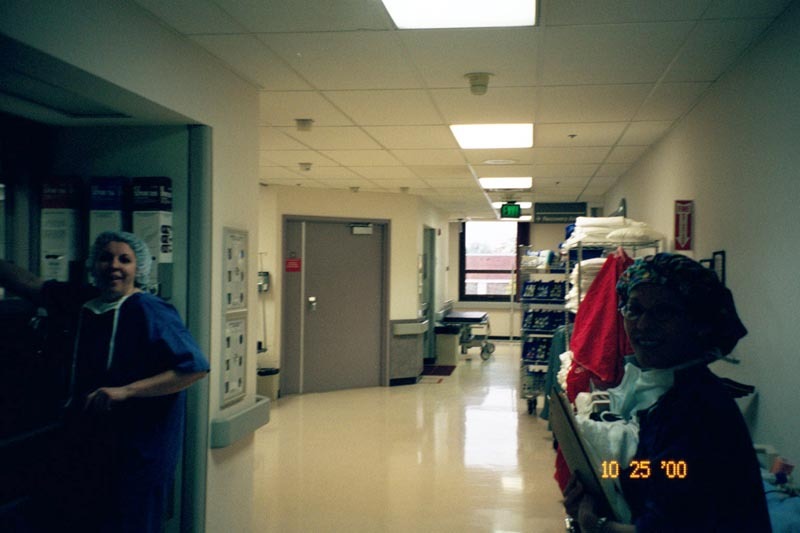 From the prep room they roll me down some more hallways to the OR. Here I am on the table. The white hose feeds warm air into the blue blanket, keeping me toasty. The anesthesiologist. 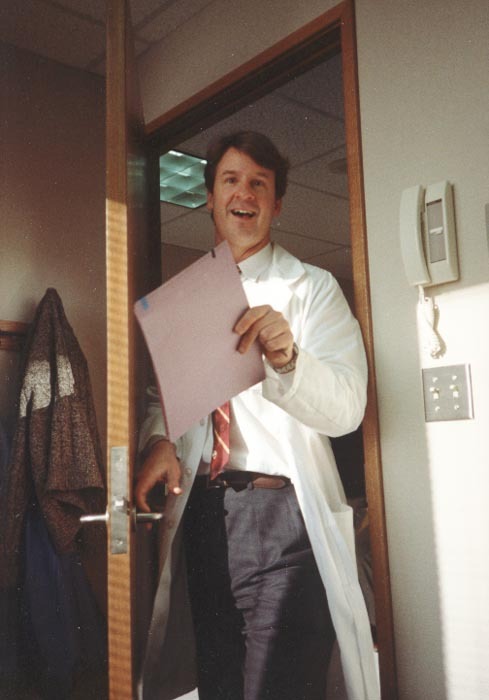 Dr. Kirby enters the room. They taped my arm up and washed it down with iodine. My finger was trapped under the tape, but I was loosing motor control and couldn't get it unstuck. They washed my whole left arm and half my chest with iodine, then covered my arm over. Things were just getting interesting when they threw a bunch of sheets over me, blocking my view. I realized, of course, that they wouldn't want me breathing into my own shoulder. But the sheets were placed right over my face, leaving me very little room to see. 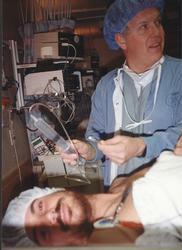 During the preparations Dr. Kirby pulled on my upper arm and commented that there was still tone in my muscles. 5 minutes latter, after they had put the draping in place I felt him pulling on my arm again. This time I could feel the humorous sliding out of the socket. It didn't hurt, but I had the distinct feeling of the humorous sliding forward then sliding back. I guess that this is a way that Dr. Kirby can verify the shoulder damage before actually cutting into me. 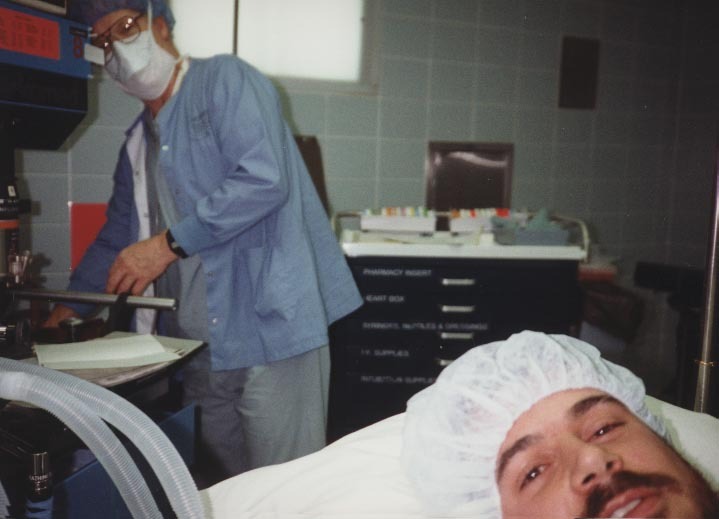 This is continued in part 2, which contains photos of the surgery itself. If you are squeamish about blood you may want to stop here.